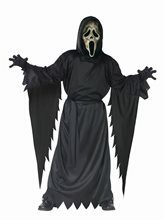 Scream Teen Costume.Includes: Hooded robe, zombie ghost face mask and fabric belt. Available Size: Teen - Standard. 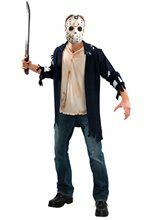 (One Size Fits Most Teens Up To Size 12) *Gloves, Shoes, Pants and Weapon Not Included. Accessories Sold Separately. 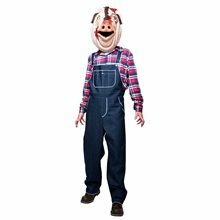 He'll make all his friends scream this Halloween in this Scream 4 - Zombie Ghost Face Child Costume. 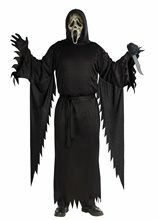 Includes a tattered, hooded robe, zombie ghost face mask and fabric belt. This is an officially licensed Scream 4 product. 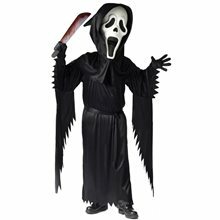 Bobble Head Ghost Face Adult Costume.Includes: Robe, Shawl, Gloves, Hood and Mask. Available Size: Mens - Standard. (One Size Fits Most Adults) *Shoes Not Included. Accessories Sold Separately. From the epic trilogy that gave you nightmares, he's back for round four! 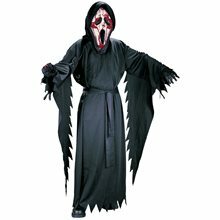 This disguise features a black robe with matching shawl, gloves, hood with rope tie and supersize lightweight Ghost Face head with bobble eyes and comfortable interior elastic head support.This is an officially licensed Scream costume. 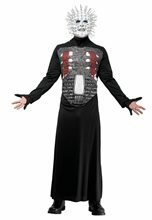 Hellraiser Pinhead Adult Costume.Includes: Mask, robe, and gloves. Available Size: Mens - Small (34-36), Mens - Medium (38-40). (See Size Chart For More Information)*Boots Not Included. Also known as "The Angel of Suffering" and "The Dark Prince of Pain," you're anything but boring. Leader of the pack when it comes to cenobites, you have no trouble turning on the charm… or sending fear into the hearts of those around you. 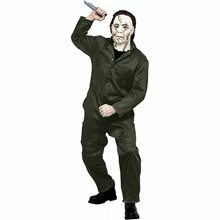 Your costume includes a very impressive pinheaded mask, a comfortable and grimly regal-looking black robe with trompe-l’oeil printed breastplate, and black thumb-and-pinky gloves.This is an officially licensed Hellraiser costume.